If approved, Silex will hold a 51-percent interest in the company, while Cameco’s current 24-percent stake will increase to 49 percent. Australian tech company Silex Systems (ASX:SLX) has signed a term sheet with uranium major Cameco (TSX:CCO) for the Silex laser uranium enrichment technology. The joint venture between Cameco and Silex seeks to acquire the 76 percent interest GE-Hitachi Nuclear (GEH) holds in subsidiary company GE-Hitachi Global Laser Enrichment (GLE), the current licensee of Silex’s uranium-focused technology. If approved, Silex would hold a 51-percent interest in the company, while Cameco’s current 24-percent stake would increase to 49 percent. Silex developed its Separation of Isotopes by Laser Excitation (SILEX) technology in 1990, and licensed its exclusively to GE-Hitachi Global Laser Enrichment in 2006. Since then, the company has worked to commercialize the technology for potential deployment in the USA. 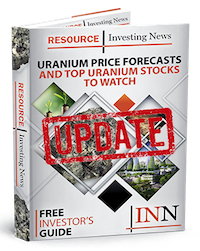 The target markets for the uranium-focused laser technology are the global nuclear fuel markets for natural and enriched uranium, which Silex estimates are worth several billions of dollars annually. “This is a very positive step forward for both Silex and GLE,” Michael Goldsworthy, Silex’s CEO said in the announcement. “Should the binding purchase agreement be successfully completed, this will provide a viable path for the commercialization of the SILEX technology through the Paducah project. The most pleasing aspect of this deal is the willingness of Cameco, one of the world’s largest uranium fuel providers, to step up to a 49 percent stake in GLE. We look forward to building on our already solid relationship with Cameco as we move forward as partners in GLE,” he added. The newly signed term sheet includes a deferred purchase price of US$20 million payable to GEH in four consecutive annual instalments of US$5 million, beginning after the first calendar year in which GLE earns revenues of US$50 million. There is also an agreed upon caveat for the restructuring of GLE, which includes an option for Cameco to acquire as much as a 75-percent stake in the joint venture down the road. “In the meantime, a reduced but focused technology commercialization effort will continue at GLE’s Test Loop facility in Wilmington, North Carolina, together with a parallel effort continuing at Silex’s Lucas Heights facility in Sydney,” noted the company announcement. Funding for the Wilmington Loop was also detailed in the term sheet, with US$300,000 per month being earmarked for the US-based project. Cameco shares were up 2.37 percent on Wednesday (February 6), to C$16.88. While Silex’s stock was up 35.14 percent, trading at AU$0.25.